Am I a good person? As far back as I can remember, I have wanted to be good. I was called miene kleines Shäfchen by my Great Aunt “Tante Greta”, which was german for “my little lamb”. I was the youngest and probably most spoiled of 4 daughters, and Tante Greta doted on me. She had no children of her own and I glowed under her constant praise. I’ve inherited the journal of my oldest (now deceased) sister Hildi. There is one reference to me, her kid sister Lydie, 12 years younger than her. “She’s very cute but boy can she be annoying.” I always tried to capitalize on the cute part. I knew how to make people like me. People closer to me were the only ones who saw the annoying part, as little kids can tend to be. As a school patrol in Grade 6 – the captain of the girls no less 🙂 – I took pride in waving to police cars as they drove by. I was on the good side. But being good is hard to pull off for too long. Not one of us has escaped the clay feet of our human condition. No one is exempt from struggles with our shadows and the selfishness that seems to take over. Romans 3:23 says that “All have sinned and fall short of God’s glory.” Scratch my “little lamb” surface, and my motives betray me. I bring out the good routine (is it a routine or is it real?) to make people like me, but under the trials of life, my goodness often falters and I start to moan and groan instead of being the hero I thought I was. This week, things came to a head for me and I had a meltdown at our Wednesday night study on the New Testament book of Romans. We were talking about God’s grace and promises. Paul was the presenter that night, and he asked the question that the writer of Romans was asking: How can God remain faithful in the context of our disobedience and unbelief? God had given the covenant to the Jews in the Old Testament. At first they rose up to the chance to be good for God, but it looked like they were constantly abandoning their half of the deal, bowing to the cultural gods of the day instead of sticking with God. Even the New Testament communities who were embracing the good news of Jesus were accommodating themselves to culture, compromising their dedication to the suffering love that Jesus modeled. Read any of the New Testament letters to the early Christian communities and you will hear how mired they got in squabbles and petty arguments. I identified with those people! I was pretty quiet during the evening’s study, feeling run down by the challenges of the workday, but I finally squeaked out a question. I didn’t exactly word it well, but I was rephrasing Paul’s beginning question: Where is God in the midst of my unbelief? I didn’t understand where God could was when all I seemed to be feeling lately was burnout and a collapse of the “good” me. I felt like quitting my job. God’s grace which extends to even the lowest of places seemed unreachable to me. Hmm, I think I’ve been here before! 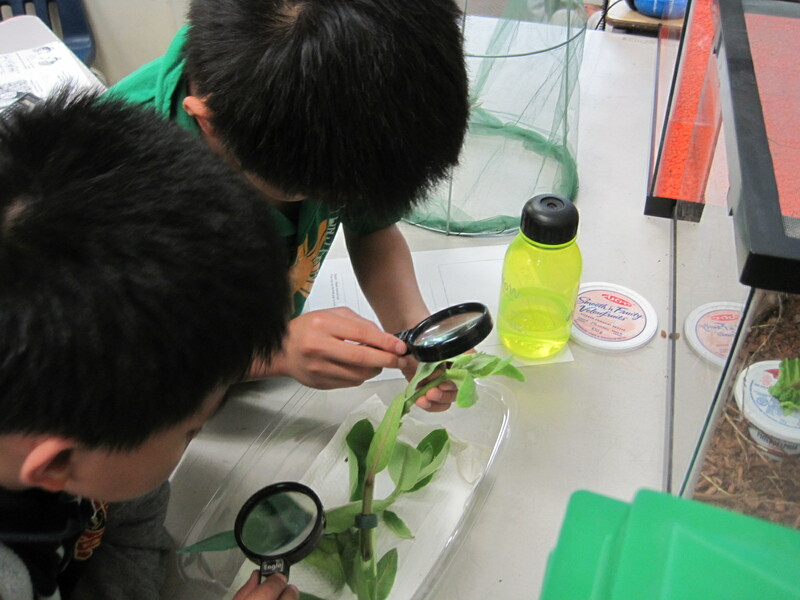 Two of my students checking out monarch eggs. Lately my students have been using magnifying lenses to study the monarch eggs and caterpillars I’ve brought into the classroom. It’s a good metaphor to apply to my blog – I use a magnifying lens of faith to closely examine each event or thought process or conversation that encouraged me each week. It never fails to encourage me and stoke the flames of faith in me. The poet William Blake wrote that a person could “see the world in a grain of sand.” Each evidence of God holds a world of meaning. in the Bible, God has a deeper magic at work in our lives, fashioning something beautiful out of our struggles and failures. In fact, God is so creative that our very stumbles are used to bring about the promise. We are not abandoned or rejected when we fail to live up to our end of the deal. God is there with infinite forgiveness, and never lets up on drawing us to him. The deeper faith response is the one I want to live by. To trust God with the challenges and curveballs life throws my way, and to ask for help. I want to use the magnifying glass to take a long, close look at the deeper magic beneath the surface appearance of my life. I want to be storied in God’s promises, not my own failings. Where did I see God this week? In the faithful responses of my friends who didn’t let me regress and who reminded me that even when our facades crumble, God is faithful and doesn’t forget us. In the friends who love me. In the hope that stirred up in the wake of my meltdown. Maybe what my Tante Greta meant when she called me her little lamb wasn’t that I was good. “No one is truly good but God,” she could have told me. Maybe she just meant to say that I was deeply loved. In the end, that’s what really matters. I think I’ll focus my lens on that story instead. This week God’s face was shown to me during a conversation, and with it came the encouragement that comes with such visits. 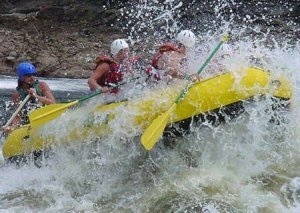 These days my life feels a bit like I’m white water rafting as I daily navigate my way through the day with the most challenging bunch of students I’ve had in a while. I love them but it takes all my concentration to stay in “response” and not “reaction” mode and I’ve been pretty exhausted. Sometimes I’m successful, other times not. I’ve never gone rafting, but I’ve heard that one of the big rules is to take a break when you’re tired. Find a section of the river that’s not flowing so hard, paddle over and stop so you can refocus. This is exactly what it felt like during our community’s conversation after the movie for Wednesday night. It was a sheltered place with people I love, and we had a long conversation about meaning amid our often messy lives. It was a time to catch my breath and regroup, and courage and faith were stirred up again. “Messes” had been on my mind in the last days. Maybe it was my usual full plate at school coupled with headaches last weekend, but I found myself moaning on Sunday night about the mess in my kitchen. The grass always looks greener on the other side of the fence, and I heard myself complain, “Why do other people’s houses always look neater than ours?” It wasn’t just the physical mess of a kitchen where the cleaning seems never-ending. I think my personal messes were catching up with me. Everything felt like too much, like the tangled cords of our modern multiple technology systems. The conversation was after a movie for our Wednesday night study. Once a month, we leave our Romans study to view a movie and talk about it. We’ve been going through a video series by Bill Moyers about the Old Testament. Various people from all religions come together to dialogue about the famous stories of the Old Testament. We watch the one hour show and then talk about its themes. Our conversation about this story was interwoven by the often tangled events of our own lives. Where is God in the messes? In the events which make us wonder if there’s any meaning or bigger picture happening. We began to talk about our friend Dave’s dad, who died this week at the age of 93. Dave had been reflecting on his dad’s life for a tribute that he was writing and would read at the funeral. Talk about a tangled life – someone who was quite an accomplished minister yet had a strong stubborn streak which impacted Dave’s life. Growing up, Dave sometimes wondered, like Abraham and Sarah, why God wasn’t coming through on the promises his dad often preached about. And yet, in the last 3 years, Dave had witnessed a miracle in his dad’s life. We’d watch Dave come home from trips to see his dad and marvel at the change he saw in his dad. Deeper love and forgiveness was in each visit, and the last words they spoke to each other were of love and blessing. Anyone who has experienced a deep rift in a relationship knows how healing it is when miracles happen. Like the characters in the biblical story, God did not forget Dave and his dad. 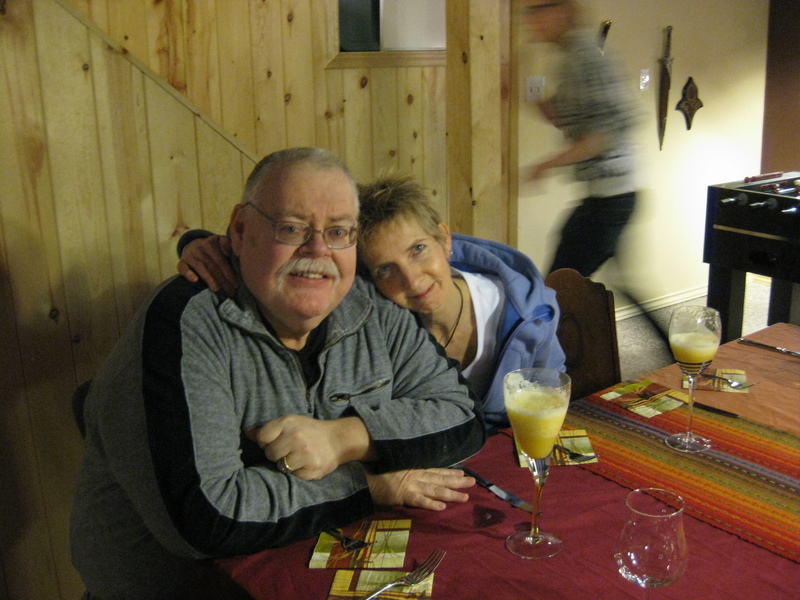 As we talked about Dave’s story, I grew calm and remembered that God never forgets us. Each week there are countless stories of ways God has provided for myself and so many others, even when I sometimes wonder how this is possible. Faith was stirred up again during this conversation and I was able to head back into the fray of the next day with renewed hope. One of the birds we spotted in the English gardens – isn’t he a beauty? tense between us. 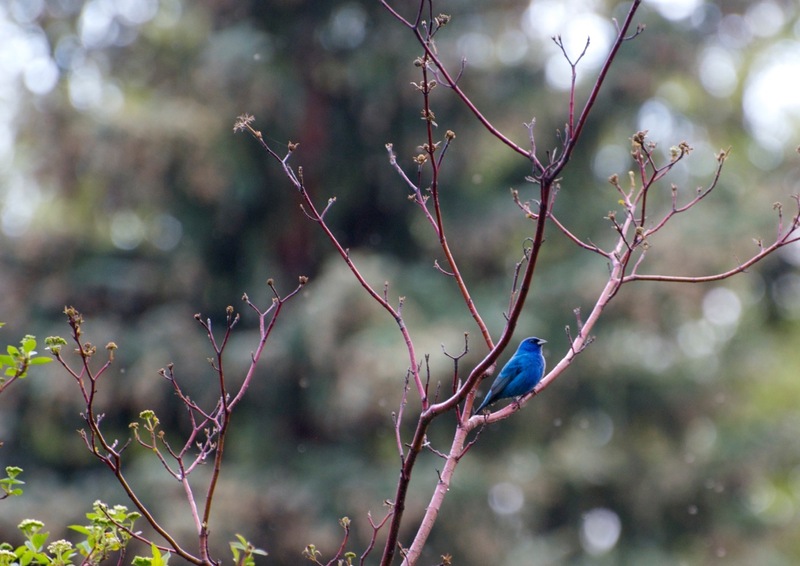 “Oh great,” I thought, “another mess to deal with, on our anniversary no less.” We decided to stick with the birdwatching plan and went to Assiniboine Park, where we’d heard there were indigo bunting birds nesting in the English gardens. Our tensions melted away when we spotted the blue birds again and again and got caught up in the beauty of the clear evening and the fortuitous sighting. It felt like a blessing from God – a clear gift despite the messes that sometimes cloud things up. Gratitude replaced anxiety. God is always seeing me through circumstances even when I can’t see it. God is in the messes, holding us together and bringing us through with meaning intact. Today I want to do the impossible – to pay back a debt of gratitude and write a tribute to a dear friend who’s turning 60 today. 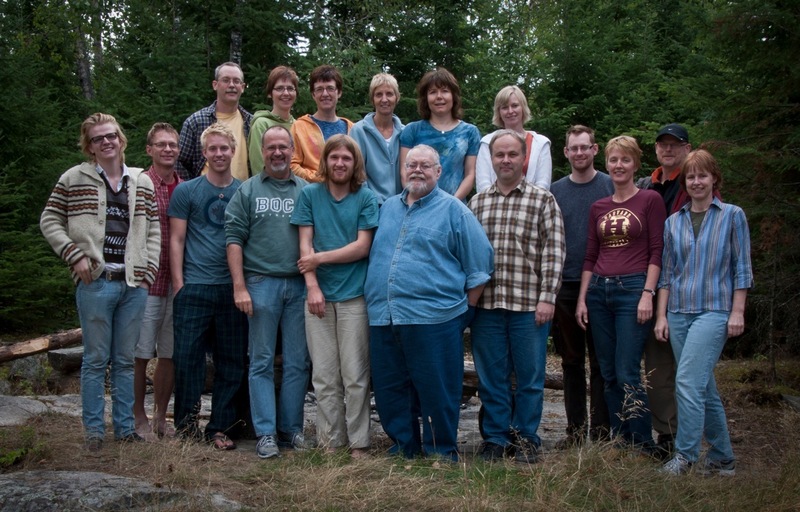 Paul Patterson is the pastor and founder of our humble house church called Watershed. I and many others are infinitely blessed to have a mentor and friend in Paul. I met Paul when I was a gangly 12 year old. He was then a young preacher and had come to my home church (North Kildonan Mennonite Brethren) to speak at the Sunday evening service. In those days, the church was my main context. We lived a “hop, skip and a jump” from our church, and I was forever walking there – traversing 2 back lanes and a street to go to girls club, choir practice, German School on Saturdays or church services (two on Sunday). As a teenager, there was “Young People’s”. It wasn’t without its dark side, but looking back, I’m grateful for this context because it pointed me toward God and I was shown God’s love by many fine people. I experienced one of my earliest “transcendent moments” there – those moments where the curtains part and you glimpse something mysterious and unshakably real. It was in this context that I heard Paul speak. Even then, he had a gift of preaching. He has a way of being human when he speaks about God – your ears perk up and like with any good teacher, your heart and mind is evoked and you want to listen (and it’s no small feat to catch a 12 year old’s attention in a sermon). I actually don’t remember what he said…except for one thing. At the end of his sermon, he read a poem and said if anyone wanted a copy, they could get one from him at the end of the service. I took him up on it and kept it for years in a notebook of treasured, collected poems. Years later, when I realized it was lost, Paul found it for me again. The poem was called “Because God Loves Me”, and was all about the unconditional love of God. Fast forward 10 years and I met Paul again at MBBC (MB Bible College, now Canadian Mennonite University), where Lyle and I and some others now in Watershed were students. He had come to the college chapel (and later at a fall retreat) to speak. His talks made God and the life of faith seem real and alive, without being “preachy” or pushy at all. It seemed natural that we begin to attend the small, inner city church that he pastored in the West End called Cornerstone. We’ve been blessed to have him as our pastor for almost 30 years – at Cornerstone and now at Watershed, which morphed out of Cornerstone 20 years ago. Paul has seen me through many of life’s stages. He prayed at our wedding and prayed a blessing when we had Joel. (He has also mentored that offspring through 21 years of changes.) Paul’s guidance is what kept our marriage intact through a time of separation, which I wrote about in an earlier blogpost. He’s taught many courses on books of the Bible, delivered many sermons (and at Watershed, sermons are more like lively discussions between us all), fostered the faith of many people while talking over coffee, and written countless emails, articles and now his memoirs. It is not easy to hold onto faith as we go through the “university of hard knocks” that life’s challenges offer us. An undercurrent of cynicism can take hold of the soul. I took the “road less travelled” when I left the larger collective Mennonite world that I grew up in, which has not been the easiest to navigate. It required some rebuilding of what I actually believed in. I’ve also struggled with a propensity towards depression and headaches, not to mention a lot of growing up to do. Paul has seen me through all of these “side-road stages”. There’s many times where I have professed faith but have been a “practical atheist”. Yet, Paul, with his beloved wife Bev, have always encouraged me (and many others) to keep fanning the flames of faith. Paul often reminds us all that we need to “hold each other’s feet to the fire”, urging each other not to forget God. Sometimes gently confronting, many times encouraging, he has always offered an insightful and specific Word which has revived and deepened my faith, and I’m not the only one. There’s a verse in the Bible that describes God’s word like a surgeon’s scalpel, knowing exactly what to cut out in order to heal. “God’s word is living, active, and sharper than any two-edged sword. It penetrates to the point that it separates the soul from the spirit and the joints from the marrow. 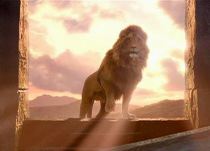 It’s able to judge the heart’s thoughts and intentions.” (Hebrews 4:12). I often think of Paul’s help this way. Like a skilled surgeon, he often knows just where the trouble lies and what antidote from God’s wisdom that will help. Probably the biggest legacy Paul has given me has been some advice he gave me years ago now. Paul has always encouraged me to write. “If you want to speak from your deepest heart,” he told me, “don’t. Write it instead.” This has become my mantra as I write and write. Whether cheering on my writing, or responding to my emails, he has always encouraged my vocation. In signing his emails, he describes himself as an “Anam Cara”, a Gaelic term meaning “soul friend”. Thank you Paul, for all your guidance over the years. You have truly been an “Anam Cara” as you have allowed God to use you. You’ve pointed me and so many others to God and to finding God in whatever circumstances we have been in. I don’t know where I’d be without you and Bev’s unconditional love, a reflection of God’s love which has stayed steady through the thick and thin of life. Many lives are infinitely richer because of your humor, conversations and love of God. I wish you a rich and very happy 60th birthday as you celebrate with us all tonight, and I hope your spirit will be encouraged and sustained in the years ahead. We all love you and are so grateful for you, Paul. Months ago now, the teachers at our school had an inservice which ended with a creative assignment. There was a pile of small stones beside paints and paintbrushes. 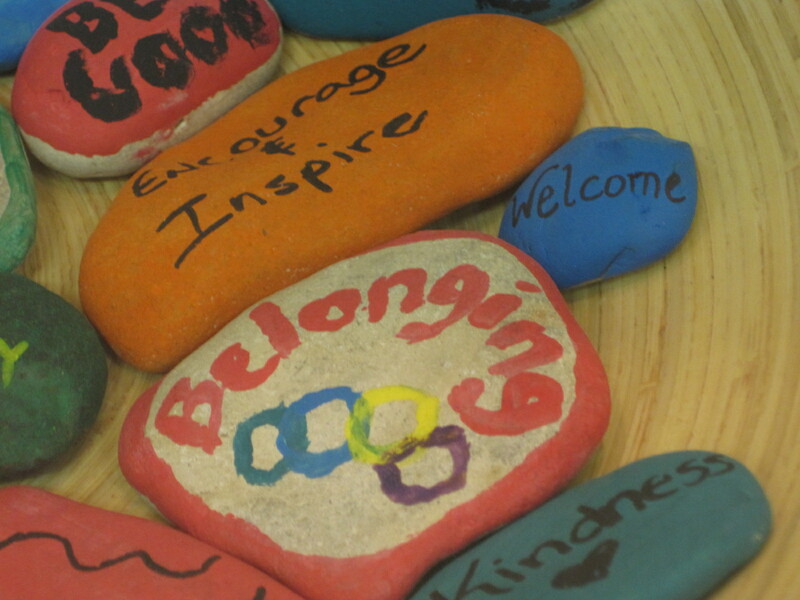 We were to think of a word to paint on the rock, expressing a wish for our school community. Many excellent words were chosen: “Happiness”; “Joy”; “Unity”, “Safety”. 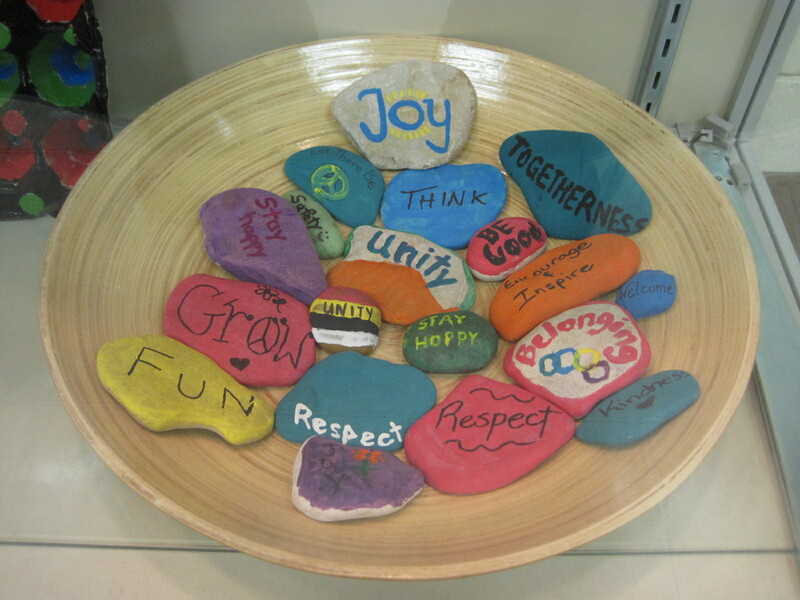 The stones were put in a basket and now sit in our art display case. The word I chose was “Welcome” – that each child and adult would feel welcomed and included, no matter what challenges face us all. It is certainly how I have felt at our school thanks to many kind people. The word has stayed with me like a prayer all these months and came back to me this past week during my morning scripture readings. This week’s theme was “service”. Scripture teaches that a Christian community is like a body, with many parts that all have a job or gift to contribute to the whole. Initially, I didn’t want to contemplate this theme. My gut reaction made me fear that if I am asked to serve, I’ll be depleted. And yet, I saw two clear examples this week that service is as much about giving as it is receiving. The guide asked, “What gift do you have?” and that’s when I thought back to my “Welcome” stone. I’ve been told that’s one of my gifts, and I thought of the stone each morning as I welcomed the kids back to class. Teachers welcome the whole spectrum – from the quiet, happy child to the ones who are more like diamonds in the rough. All come through our doors. It’s funny – I drag my feet some mornings because I think that being a welcoming hostess will be an extraction. But I invariably find that something kicks in as I remember that I love the kids. In welcoming them, I somehow remember the ways I myself have been welcomed. I have received love, guidance and support in so many ways. I have been given the gift of second chances from God and my faith community. I know I am not alone in this. Each person in our community would say the same. Despite the shadows that trip us up again and again, we are infinitely forgiven and loved. As one of my favorite verses says, “Nothing can separate us from God’s love.” (Romans 8:39) It gives me joy to welcome the kids. I had another example of how service ended up being a gift to me as I gave it out. This time the gift was in writing. Every week as we study a scripture passage, we answer a few questions to help us focus. It was the same as the welcoming – I was dreading doing the writing because I thought it’d be an extraction, but it ended up being strangely refreshing and reorienting. My thoughts got organized. It was as if I’d just gone for a spa treatment as I wrote about important truths that were bigger than the small stuff I can get so preoccupied with. Gifts are both something we give to the world and what we receive. I was grateful this week that I saw ways that God provides for me. P.S. – Another encouraging gift came to me this week in the form of my son Joel’s creative ventures. He makes flowers dance in these little videos he is putting together for his project. He is giving something to the world and I see how much joy it gives him every day. Please have a look at his 5 minute video.